The Air Jordan 31 is a great product according to most buyers. They just love it. Nearly all users agree that the shoe is very comfortable. The full-length Zoom cushioning feels incredible, several declare. A lot of users state that the shoes have excellent ankle support; the ankle pillows do their job. According to some wearers, the shoes are easy to break in. A couple of them even claim that no break-in time is required. A good number of reviewers say that the shoes fit true to size. Some comment that the overall fit and lockdown is perfect. Several purchasers compliment the shoe’s clean and minimalist style. 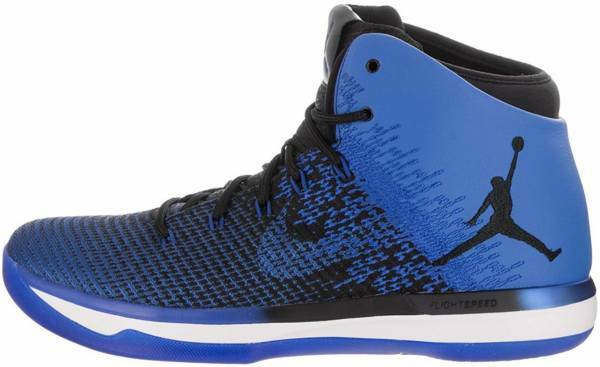 Several are saying that the Air Jordan XXXI is durable and made of the best materials. These MJ shoes are breathable and lightweight, some players remark. Several users are complaining about the shoe’s traction. The grip is inconsistent, and it is the worst on dusty courts. With the launch of the AJ 33, players saw a great improvement in this category. The Air Jordan XXXI is easily gets dirty and hard to clean, a few claim. Most testers find the protruding Zoom a bit unstable and wobbly. A handful of wearers remark that these Michael Jordan basketball shoes are uncomfortable. The ankle collar digs into the Achilles and rubs the ankle. Over the years, Jordan Brand has consistently delivered better performance basketball sneakers than any other brand. They lead the industry by implementing innovations that work. With the Air Jordan XXXI, it feels like they have taken two steps forward and one step back. It is a decent hoop shoe. Its clean style and overall comfort make it suitable for everyday use as well. However, for its price, there are better performance basketball sneakers. The shoe is so good from the midsole up that the shoe is still in my rotation, even though the traction is horrible. Overall, the cons of the shoe that it me gave was not enough for me to keep these in my go to rotations. All in all, the Jordan XXXI (31) is a mix of good and bad. It has been over three decades when the original Anti-Gravity machines were released. Paying homage to the iconic AJ 1, the Air Jordan XXXI realizes three decades of innovation. Pure, minimal, and raw; the new Air Jordan is a reflection of the original. Mixing tradition and innovation, the AJ XXXI is molded after the silhouette of the first Air Jordan and fitted with updated technology. It represents a balance of Jordan Brand’s revolutionary performance and transcendent style. Worn by Jordan Brand’s frontman Russell Westbrook, the design is equipped with innovative Zoom Air cushioning and FlightSpeed technology to attack the paint. The flexible Flyweave upper combined with patent leather provides all-around support. The Air Jordan 31 is engineered with the game’s best players in mind. Cushion. One of Michael Jordan’s favorite features of the AJ 1 is its low-to-the-ground profile. The Air Jordan XXXI replicates this by placing a FlightSpeed plate on top of a full-length Zoom Air bag. The FlightSpeed plate supports the entire foot while the full-length Zoom Air bag provides cushioning without raising the shoe’s profile. FlightSpeed technology is designed to evenly distribute the compression force of the foot over the full-length Zoom Air unit, maximizing its spring-back response and allowing explosive steps to blow-by your defenders. This low-profile cushioning setup eliminates wasted motion and provides enhanced court feel, responsiveness, and lateral support. Traction. The outsole is made of translucent rubber that delivers quality traction on a variety of surfaces. It features a herringbone pattern for a multidirectional grip that minimizes slips, enabling you to make quick cuts on the court. Length and Width. The Air Jordan 31 fits true to size and can accommodate wide feet. Lengthwise, it runs a bit short; normal and narrow footers may need to try out a pair before purchasing. Lockdown. The lace system utilizes Flywire technology for a locked-in fit. These strong filaments are strategically placed to wrap the midfoot and provide support precisely where it is needed. The high-cut collar features six anatomical pods that grip the ankle for maximum containment. An inner sleeve wraps the foot for a personalized fit while a leather heel counter provides locked-down support. The Air Jordan 1 was a traditional leather basketball shoe. Now, knit and woven have become performance standards. The idea for the Air Jordan 31 is to combine the best features of each material. The shoe’s one-piece Flyweave and leather upper is the first of its kind. Flexible Flyweave in the forefoot transitions seamlessly to a supportive synthetic leather in the heel. This one-piece upper allows your foot to move naturally while keeping it contained during quick cuts and transitions. Drawing inspiration from the first Air Jordan’s high-top silhouette, the Air Jordan 31’s upper includes several iconic Jordan elements. The original Air Jordan Wings logo and Nike Swoosh (not seen since the AJ 1) is reintroduced, and for the first time, the Jumpman and Swoosh appear alongside one another. The Air Jordan 1 featured a prominent Nike swoosh, but the Jumpman logo soon became iconic, and the swoosh was phased out. With Jordan’s blessing, the Swoosh intentionally fades into the famous Jumpman logo as a new-model nod to the original Air Jordan. The Air Jordan XXXI seeks to push the envelope as a hybrid on-court/off-court sneaker; lightweight support for the world’s highest-flying athletes, and rich material details that exudes off-court sensibility. The Jordan Brand launched several AJ 1-inspired colorways as well as player exclusives for JB-sponsored schools, athletes, and tournaments. Nike and Jordan Brand are equipping their athletes with battle-tested gear to start off the 2016 NBA season. According to Nike, ‘Battle Grey’ represents the challenges their athletes face during the start of a new campaign. The Air Jordan XXXI ‘Battle Grey’ features a full grey upper with a cracked texture. Silver accents and an icy outsole complete the silhouette. The AJ XXXI ‘Fine Print’ is inspired by the original contract Michael Jordan signed with Nike. This ink-and-paper inspired colorway features a combination of black, white, and wolf grey. Completing the theme is Michael’s signature that can be seen through the translucent outsole. This limited edition colorway was sold exclusively at Jordan Brand’s pop-up store located at 221 Chartres St. during the 2017 All-Star festivities in New Orleans. The Air Jordan XXXI ‘Karat Gold’ is constructed with premium leather and covered in metallic gold. The Air Jordan XXXI ‘Why Not’ pays tribute to Russel Westbrook’s record-setting and MVP-winning season. The shoes are molded after his PE pair that sports the AJ 31 upper combined with an AJ 30 sole unit. Featuring OKC-inspired hues, the ‘Why Not’ is dressed in a combination of black, grey, orange, and blue. Other details include elephant print, galaxy details, Russel’s logo on the tongue, and his “Why Not” motto on the sole.